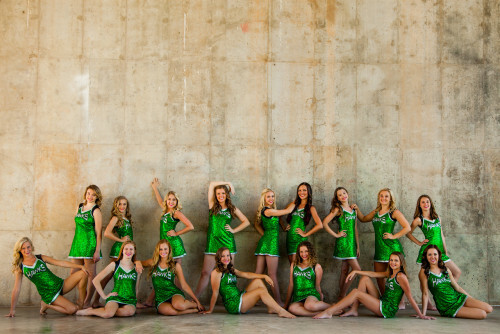 The Emeralds try-out meeting will be held March 7th in the LSW auditorium from 6:00pm-7:00pm. All dancers interested in trying out are required to attend this meeting with a parent or guardian present. Emerald tryout forms and teacher recommendations will be due on Friday, March 22nd. You can take or mail these to the LSW office with attention to Chelsea Seiboldt. Tryouts will be held March 28th and 29th at 5pm in the LSW main gym. The 2018-2019 Emeralds Dance Team will be posted on the Emeralds social media the night of March 29th. March 19, 2019: 6:30am – 7:30am Learn the Dance. Take the Sports Quiz. March 20, 2019: 6:30am – 7:30am Review the Dance and learn 2 chants. March 21, 2019: 6:30am –7:30am Review and learn cheer. March 22, 2019: Tryouts will begin at 3:30pm. plus Parent Meeting will be at 5:30pm at LSW. March 19-21, 2019: Participants need to wear athletic clothing. T-shirts, Tank tops, athletic shorts/crops/pants, cheer shoes/running shoes, etc. March 22, 2019: Participants need to wear solid black shorts and a solid white shirt. Tennis shoes or cheer shoes need to be worn with no show socks. Hair needs to be in a mid/low ponytail with a bow and make up done. NO FLY AWAYS. The overall appearance needs to be GAME DAY ready. A sports quiz will be given on the first day of tryouts. It is important that cheerleaders are knowledgeable about the basics of the sports that we cheer for. All participants will be writing out the words to the school fight song on day 2. In order to tryout for the Competition team, the minimum requirement is a standing back handspring AND a round off back handspring. The coach will need to be notified by the 21st if interested. All grade levels may tryout for this and a maximum of 20 girls will be put on this team. If you have any questions leading up to tryouts, please email Coach Becky at bspataro@lps.org.